OK, I know. "When in Rome, blah, blah, blah...." However, sometimes, even surrounded by all this glorious ceviche and barbacoa and pollo pibil, you just want a burger; a good old American style hamburger. After all, is there anything quite as lovely a thick juicy burger topped with all your favorite fixin's? I think not. Until just a few years ago, burger aficionados (like my husband) were limited to the thin, overcooked slabs of gray "I don't know what kind of meat" slapped into a stale Bimbo bun and slathered with lime flavored mayonesa. Then, along came Fusion, serving up a proper hamburger, cooked to your temperature of choice and topped with cheese and fresh veggies. This one menu item alone kept us coming in for lunch time and time again and we were satisfied in the knowledge that a fine burger could be had in Playa del Carmen. Skip ahead a few more years to 2010. There are now half a dozen restaurants offering up their spin on the traditional burger, each one more delicious than the next. Each establishment is buying good ground sirloin or Angus, some are even grinding their own special blends for a "signature" burger experience. I can safely say that Rob has personally sampled his way through every burger offered from Tulum to Cancun, so I consider him the expert on this particular culinary quest. I have deferred to his judgment in compiling our list of the Top 5 Hamburgers on the Riviera Maya. Wicky's Wicked Burger - These guys are doing it right! 8 oz. of top grade sirloin on a toasted bun topped with fresh avocado, apple wood smoked bacon, pepperjack cheese and chipotle mayo. At 90 pesos, this big burger is a real treat in the "beach eats" department and you sure can't beat the view. Kick it up a notch by adding an order of Wicky's famous fries with truffle oil and Parmesan cheese. Heaven! John Gray's Place, tucked away in Calle Corazon, serves up a hamburger at lunchtime that is exactly the kind of burger you would expect from a world class chef. Angus beef, grilled to perfection and topped with caramelized onions and Gouda cheese, this burger is two handfuls of hand-ground happiness. 120 pesos and well worth it! Indigo Beach Club at El Taj Beachfront has been touted as one of the best restaurants in Playa del Carmen since its inauguration just a few months ago. We have had the pleasure of dining there and sampling quite a few of the diverse and delicious menu offerings. We were happy to discover another great burger option. 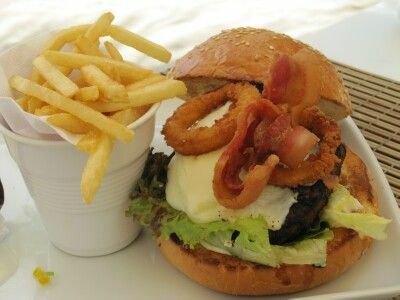 8 oz of top sirloin, smothered with cheese and topped with crispy onion rings and bacon, this burger is a home run. Served with crispy fries at 130 pesos. Richard's Steakhouse and Quarterdeck, located on the marina in Puerto Aventuras has been serving up steak and seafood dinners to throngs of tourists for years. We discovered this place 5 years ago when we started building our condos just around the corner. Since then, Richard's has been a favorite lunch stop for us and their Pizza Burger is one to rave about. Thick and flavorful and always cooked to order, this big boy is topped with marinara sauce and Mozzerella cheese. For an extra kick, ask them to throw on some sauteed mushrooms! This is our list of Top 5 burgers on the Riviera Maya. Share with us some of your favorites! Wicky's Burger rocks! Those fries with truffle oil are unreal!! I know right! I crave them!!! Thanks for the tasty insight. I will definitely check these places out. There are certainly some things I miss since moving to Cozumel and burgers are certainly one of them. Any tips on the best Indian cuisine or perhaps sushi? Thanks for the nice comment! Indian food is nearly impossible to come by in Playa del Carmen. I had a friend who was catering good curries out of her home for awhile but she is gone. Closed also is garden of Eating which was putting out some nice Indian dishes. Thanks for the info ; I will make a point of checking those locations . Wicky's runs a close second, but nothing, nothing beats a John Gray burger. Now I know its the Gouda cheese that provides the "kicker," I can order more with confidence. Monday, September 13, 2010 12:46 PM by "Life's a Beach"